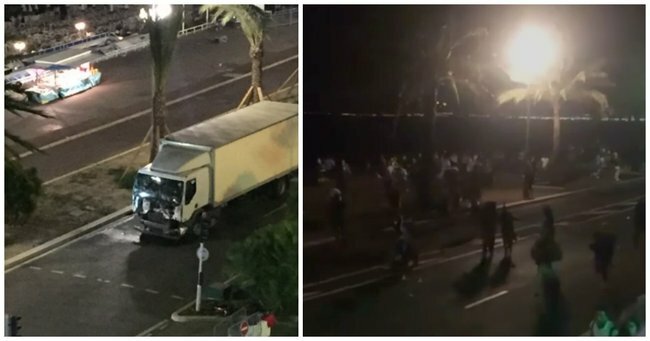 Terror attack France, Nice: 30 dead as truck rams crowd. Nice: Reports of 30 dead as truck rams into Bastille Day crowd in French city. There are reports 30 people have been killed and up to 100 injured after a truck crashed into a crowd celebrating Bastille Day in the southern French city of Nice. French television station BFMTV reported the truck driver was shot dead after the incident, which unfolded at the famed Promenade des Anglais. Soldiers, police and ambulance crews were at the scene, and authorities from the local Alpes-Maritimes prefecture urged residents to stay indoors. Local media called the incident a terrorist attack. Former Nice mayor Christian Estrosi tweeted that “dozens” of people had likely been killed and photos on social media appeared to show bodies lying on the ground. ABC producer David Coady was at the scene, and said he “joined throngs of people” running away from the promenade. “Saw a truck amongst people when the screaming started. About 50m away,” he tweeted. An AFP reporter described seeing a white van driving at high speed onto the famed promenade as people were leaving after the fireworks display. “We saw people hit and bits of debris flying around,” he said, adding that the incident took place near the city’s famed Hotel Negresco. Terrified pedestrians screamed as they fled the area. “It was absolute chaos,” the reporter said. Witnesses also described hearing gunfire, but this was not immediately confirmed by the authorities. A photo on social media showed a truck with what appeared to be bullet holes in its windscreen.